The name of the ministry is UGNAYAN (Filipino Ministry) at St. Francis of Assisi Church. “UGNAYAN is a committed Filipino community at St. Francis of Assisi Parish that professes to live the gospel and expresses love for Christ through prayers and ministry to one another and those others in need, to lift the spirit of the alienated and the newly-arrived by creating a ‘home away from home’. 1. To able to nurture committed leaders through formations, workshops and seminars. 2. To promote awareness and encourage participation of members to fulfill the mission of UGNAYAN. The Filipino layman, Lorenzo Ruiz, and 15 companions were martyred at Nagasaki, Japan in 1637 and were canonized by Pope John Paul II in Manila, October 18, 1987. Lorenzo was of Chinese origin and lived in Binondo, the Chinese section of Manila. He was the father of a family and he went to Japan with the Dominican missionaries in order to avoid arrest for a crime of which he was accused. All 16 martyrs were either members of the Dominican Order or in some way associated with it. When the news of their martyrdom reached Manila on December 27, 1637, a solemn Te Deum was sung in the church of Santo Domingo. 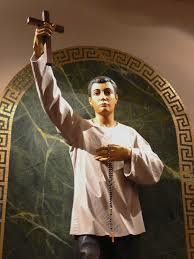 Lorenzo Ruiz is the first native saint of the Philippines. Lord God, in our service to you and to our neighbor give us the patience of the holy martyr Lorenzo Ruiz and his companions; for those who suffer persecution for the sake of justice are blessed in the kingdom of heaven. Amen. Our ministry is officially a member of the Archdiocese of New York’s FILIPINO APOSTOLATE program. The ministry sponsors the Sacred Heart Devotion during the 6:15 pm First Friday masses with fellowship afterwards. Lectio Divina is held by the ministry every Third Friday of the month. They also welcome interested individuals to join their music ministry. Rehearsals are on two consecutive Thursdays leading to the First Friday at the music room of the St. Francis Adult Education Center.